The Great Pyramid, the largest of the three, was built by the pharaoh Khufu and rises to a height of 146 meters (481 feet) with a base length of more than 230 meters (750 feet) per side. The greatest difference in length among the four sides is a mere 4.4 cm (1 ¾ inches) and the base is level within 2.1 cm (less than an inch), an astonishing engineering accomplishment. 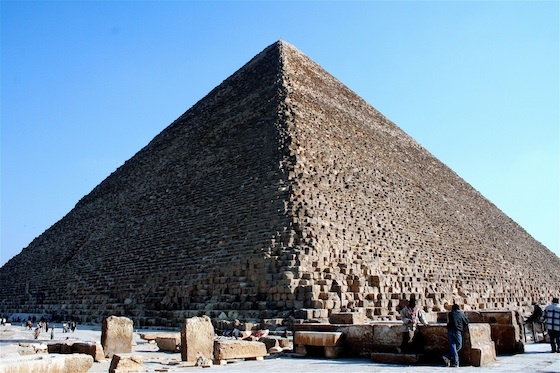 The pyramid contains an estimated 2,300,000 blocks, some of which are upwards of 50 tons. 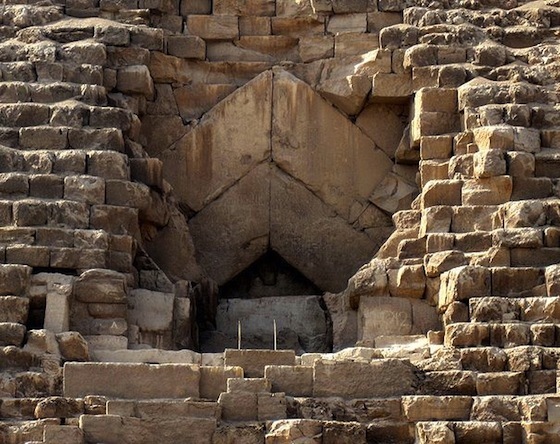 Like the pyramids built by his predecessor Snefru and those that followed on the Giza plateau, Khufu’s pyramid is constructed of inner, roughly hewn, locally quarried core stones, which is all we see today, and angled, outer casing blocks laid in even horizontal courses with spaces filled with gypsum plaster. The fine outer casing stones, which have long since been removed, were laid with great precision. 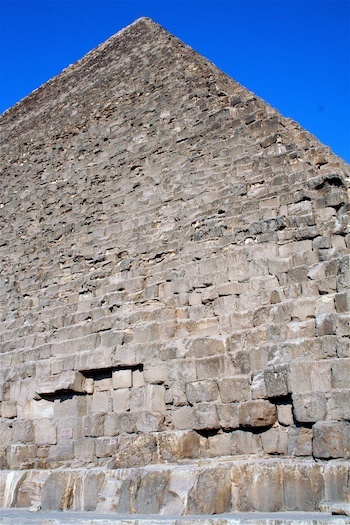 These blocks of white Tura limestone would have given the pyramid a smooth surface and been quite bright and reflective. At the very top of the pyramid would have sat a capstone, known as a pyramidion, that may have been gilt. This dazzling point, shining in the intense sunlight, would have been visible for a great distance. 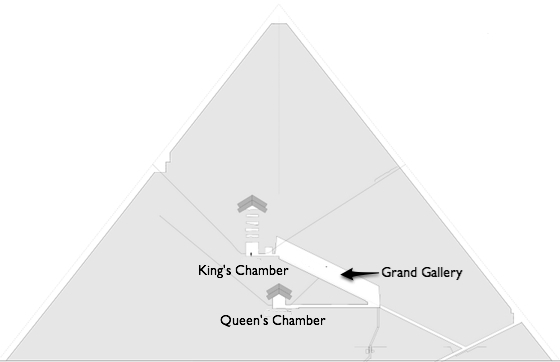 The interior chambers and passageways of Khufu’s pyramid are unique and include a number of enigmatic features. There is an unfinished subterranean chamber whose function is mysterious as well as a number of so-called ‘air shafts’ that radiate out from the upper chambers. These have recently been explored using small robots, but a series of blocking stones have obscured the passages. When entering the pyramid, one has to crawl up a cramped ascending chamber that opens suddenly into a stunning Grand Gallery. This corbelled passage soars to a height of 8.74 m (26 feet) and leads up to the King’s Chamber, which is constructed entirely from red granite brought from the southern quarries at Aswan. Above the King’s Chamber are five stress-relieving chambers of massive granite blocks topped with immense cantilevered blocks forming a pent roof to distribute the weight of the mountain of masonry above it. The king’s sarcophagus, also carved from red granite, sits empty at the exact central axis of the pyramid. This burial chamber was sealed with a series of massive granite blocks and the entrance to the shaft filled with limestone in an effort to obscure the opening. 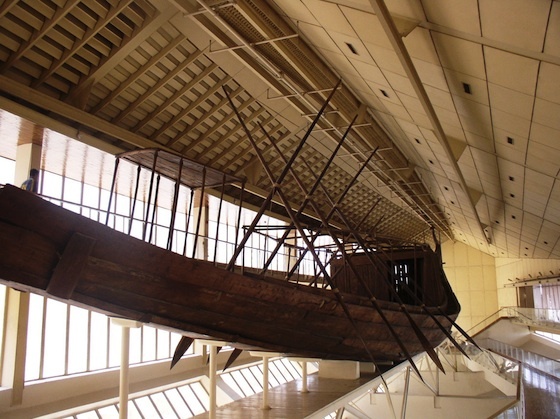 Khufu’s mortuary complex also included seven large boat pits. Five of these are located to the east of the pyramid and were a sort of model; these brick-lined boat shaped elements were probably intended for use in the afterlife to transport the king to stellar destinations. Boat burials and models of this type had a long history in royal mortuary contexts—a fleet of 14 such pits, containing actual boats averaging 18-19 meters (60 feet) in length encased inside, were discovered at a Dynasty 1 mortuary enclosure in Abydos, the cemetery of Egypt’s earliest kings. Often, however, as with Khufu, the pits were simply boat shaped models rather than containing actual boats. In addition to these model boat pits, however, on the south side of the pyramid Khufu had two massive, rectangular stone lined pits that contained completely disassembled boats. One of these has been removed and reconstructed in a special museum on the south side of the pyramid. This cedar boat measures 43.3 meters (142 feet) in length and was constructed of 1,224 separate pieces stitched together with ropes. These boats appear to have been used for the funerary procession and as ritual objects connected to the last earthly voyage of the king, and were then dismantled and interred. Cite this page as: Dr. Amy Calvert, "Pyramid of Khufu," in Smarthistory, August 8, 2015, accessed April 21, 2019, https://smarthistory.org/pyramid-of-khufu/.